Cut snowflakes out of white paper and paste onto light blue cards. On white cards glue sparkly white and silver glitter on the top or in a line going down the front of the invitation. Glue white feathers on the top of plain blue note cards and write party information inside with a blue pen or sharpie. Make the invitation look like a snow globe. 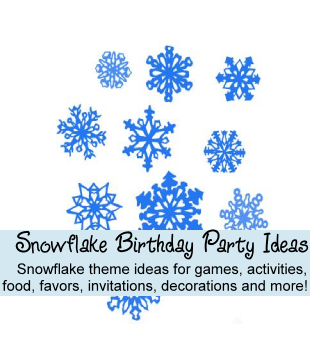 Blue and white are great colors to use when decorating a snowflake party. Make paper or buy plastic snowflakes and hang them from the trees outside the party venue. Cover the door to the party with them and hang up white strings of Christmas lights inside and out. Draw snowflakes on the walkway or driveway with white chalk. Hang up snowflakes inside on the ceiling with string to bring the flakes inside to the party. New bags of pillow stuffing will look like snow when stretched out over tables and in the corners of pictures where snow would collect if it were outside. To make icicles cut up strips of crepe paper and tape one side to the tops of doorways and mantels and let the other end hang down like an icicle does. Decorate the party table with a white over blue polka dot tablecloth, white plates, napkins and cups and then add a little sparkle with silver confetti or silver snowflake ornaments in a bowl. Fill silver metal containers or pretty glass containers with snacks and candies. You’ll need a new roll of toilet paper (snow) for this icebreaker. Have the party guests sit in a circle and tell them you are going to pass around some snowflake sheets. Without telling them why ask them to take as many snowflake sheets as they think they will need for the game. Pass the paper around without any further instructions and have the guests take sheets of paper off the roll. After everyone has taken sheets tell them that for each sheet they have they have to share one thing about themselves. This game is fun and easy to set up and kids love it. The object of the snow wrap is to see which team can wrap their partner in snow (toilet paper) first. Separate party guests into groups of 2 or 3. Every group gets a roll of toilet paper for each person who will be wrapping. The groups choose who will do the wrapping and who will be wrapped. On "go" the kids who are wrapping will give the end of the toilet paper to the person being wrapped and they will hold the ends in their hands. Then they will wrap their toilet paper around and around until they are out of paper and the person being wrapped is covered from head to toe. First group to finish their rolls first wins. Have a Scavenger Hunt and make lists of only white and blue items. Our Scavenger Hunt page has sample lists to get you started. Tie a half blown white balloon to each guests ankle with string or curling ribbon about 18" long. When everyone has their "snowball" attached to their ankle an adult yells "Snowball Stomp!" and the kids will try and stomp and break the other children's balloons while trying to protect their own. Teams race to move their "snow" from one side of the room and back. For each team you will need cotton balls, ping pong balls or large foam peanuts and a broom. Give each team the same number of items of "snow" and a broom and have them one at a time race to the other side of the room and back while herding their "snow" with the broom. This game works best on a floor with a hard surface such as wood or tile. If the kids are older set up a fan at the opposite end of the playing field to make it more challenging. The first team that has all of their players complete the relay wins. Wrap up the party favors in white and blue polka dot material.